Dates of birth and death unknown. Disciple of Ichikawa Danjûrô I, he started his career in Edo, performing as a wakashugata under the name of Ichikawa Kodayû I. He took the name of Ichikawa Jûgorô at the Nakamuraza in the 11th lunar month of 1716, playing the role of Nenoi Koyata in the kaomise drama "Mitsudomoe Katoku Biraki", which also celebrated the shûmei of Arashi Kiyosaburô II. He played in the same theater in the 2nd lunar month of 1717 the role of Chichibu no Shigeyasu in the new year drama "Kaidô Ichi Muneage Soga". This was most likely his last stage appearance in ôshibai. No more record afterwards. Born the 26th of January 1902. Son of Ichikawa Ennosuke I, he made his debut on stage in September 1905 at the Kabukiza, where he received the name of Ichikawa Kômori I and appeared in a kôjô celebrating the 2nd anniversary (3rd memorial service) of the passing away of Ichikawa Danjûrô IX. He became nadai and took the name of Ichikawa Kodayû II in October 1918 at the Kabukiza, playing the role of Hakoômaru in the drama "Zui Ichikawa Narukami Soga". He was a member in 1920 of the first Shunjûza, a study group led by his brother Ichikawa Ennosuke II, whose main advisors are the playwright Osanai Kaoru and the actor Ichikawa Sadanji II. In 1927, he joined the Shingeki Kyôkai, the New Theater Society. 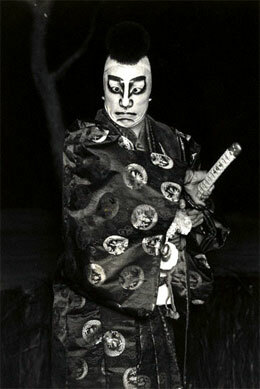 In 1929, he performed in the Shinkoku-geki troupe, famous for its speedy, energetic and realistic sword fights. From January 1931 to April 1932, he was a member of the second Shunjûza. He spent most of his career in modern theater troupes or performing in movies or TV dramas In May 1963, he took part in the special program at the Kabukiza for the great 3-generation Omodakaya shûmei of Ichikawa En'ô I, Ichikawa Ennosuke III and Ichikawa Danko IV, playing the role of Tôkurô Morinaga in the danmari "Setsugekka Mie no Danmari". He appeared on stage for the last time in October 1975 at the Kabukiza, where he played the role of Kinoshita Yaemon and Hoshina Yasuyuki in the dramas "Shinsho Taikôki" and "Kasuga no Tsubone". He died the 10th of January 1976. He was the father of Ichikawa Kômori II.